The Problem: Blunt cutting blades, minimum power. Improved blades! Long-lasting power!BaBylissPRO Forfexhaven't re-invented the wheel but improved on what was already a superior cutting tool. 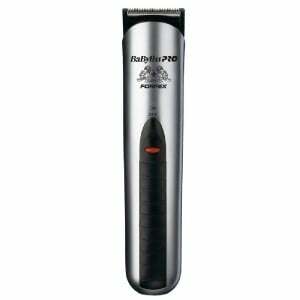 The new ultra-thin detachable 30mm steel blades on the FX760 Professional Cordless Rechargeable Trimmer feature a fine-tooth pattern powered by high-torque motor, whilst the ergonomic design provides all the comfort, convenience and control required by the discerning hair professional. Ideal for trimming hair from necklines, hairlines, sideburns, beards and moustaches.